Perhaps we shouldn’t expect much from KTVU these days in the way of fact-checking — Bay Area viewers should be used to the exceptional sloppiness seen in reports like the attempted hit on bike-share, the self-documented harassment of bicycle riders who don’t wear helmets, and, of course, the infamous fake names of pilots involved in the Asiana plane crash at SFO. But a new segment from David Stevenson — KTVU’s helmetless heathen hunter himself — quickly descends into incoherence, arguing that parking spaces in San Francisco are being eliminated at a drastic rate because of parklets, bike lanes, housing, and other things that are certainly less important than car storage. 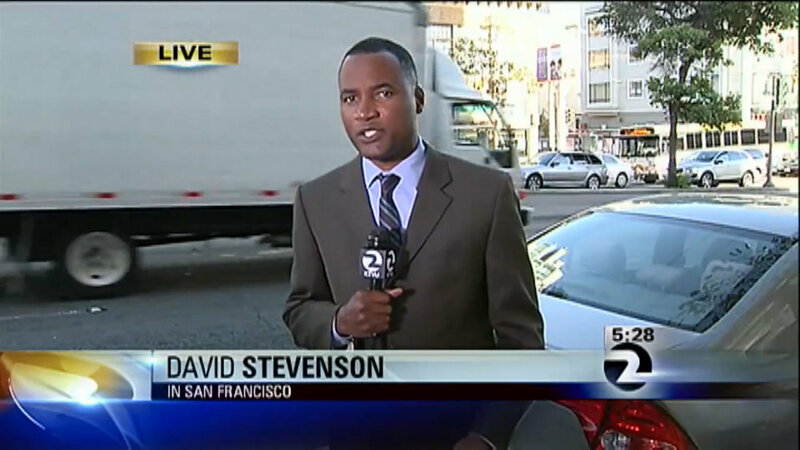 KTVU's David Stevenson is on the scene of a parking lane to bring you some false statistics. As far back as 2006, the city used a formula to estimate 603,000 public and private parking spaces on the streets, in lots and garages. But that number was downsized to 448,000 in 2012 after a sweeping citywide parking space survey. To the uninitiated, this probably seems like the city has lost a quarter of its parking, but of course it only indicates that the city has recently started to measure its parking supply more rigorously. The 2006 estimate was basically just a guess, while the latest number was based on an actual citywide count of parking spaces done in 2010 (the first of its kind in the country), then updated in August 2011 with a survey of 54 percent of SF’s streets [PDF]. What Stevenson doesn’t mention at all is that the formula and the count didn’t even measure the same thing: The 2006 estimate included all parking, private and public, while the more recent counts have only measured publicly accessible spaces. As Matthew Roth noted in his Streetsblog article on the SFMTA’s massive 2010 public parking count, the city’s private parking supply hasn’t been comprehensively measured yet, but experts estimate it could bring the citywide supply as high as 800,000 (nearly one parking space per San Franciscan). A full accounting of the city’s changing parking supply would also factor in the continuing construction of off-street parking. Parking is constantly being added in the course of development — just yesterday, the Planning Commission approved a grocery store and 136-unit development in Hayes Valley with 275 parking spots. The net change in parking spaces that results from those developments depends on how much parking those buildings replace and how much is being constructed. Looking at on-street spaces alone, KTVU asserts that “San Francisco has lost 3,000 parking spaces to new construction, new bus stops, parklets, bicycle lanes, and even new bicycle-share stations” in the last three years. Is this significant? As SFMTA spokesperson Paul Rose points out in the segment, re-purposed parking spaces has likely amounted to no more than one percent of the city’s street parking supply of 281,700 spots (according to the August 2011 count [PDF]). One percent. How alarming! Meanwhile, the vast majority of curbside space remains dedicated to private automobile storage. And even most of the 3,000-space reduction in on-street parking probably isn’t due to parklets and bike lanes. The 38 or so parklets that have been installed in the city since March 2010 typically replace two parking spots each (though a few plaza projects and the Powell Street mega-parklet replaced more), so we can estimate the total number of parking spots removed for those is somewhere around 100. As for bike lanes, the two high-profile projects that converted parking spots were the three blocks of Fell and Oak and 17th Street. Together they removed at most 300 parking spaces. Other bike and pedestrian safety improvements, like daylighting, have removed some parking, but it’s hard to see how you’d get to a total of more than five or six hundred. And as Rose told KTVU, the SFMTA has added 630 on-street parking spaces to replace spots removed in these projects (usually by converting parallel parking spots to angled parking). I won’t even go into problems with the KTVU anchors’ confusing introduction, relating this segment to Supervisor Scott Wiener’s new legislation that would expand the ability of landlords to rent out private parking spaces. Besides, in the KTVU newsroom, it apparently doesn’t matter if the facts don’t support the thesis, or if the city is a better place because some parking spots got converted into space for walking, biking, and transit. What matters over there is that some motorists said finding a parking spot is inconvenient — that’s the story. Imagine if we gave that 300+ sq ft of parking space to each resident as actual living space? or new ones? Housing problem…? New campaign: “Your property tax pays free parking for your neighbors three cars”. There’s only parking, everywhere, and someday there might not be parking on a street and that is just unacceptable. KTVU is a joke. It’s been sliding downhill for years. However, if FOX buys out KRON and makes it a FOX owned local, KTVU will be outta biz soon anyway. And they’re replacing that lovely parking lot with a park! So sad. I think that any tally should include up-to-the-minute counts of gridlocked tunnelers inching toward the freeways. Gotta love the drive-through interview at 1:11. But parking is open space!